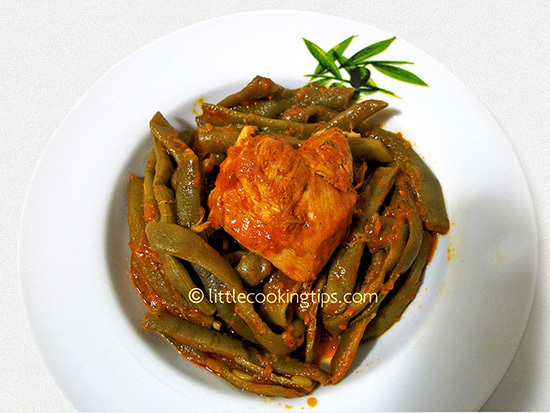 ﻿ Fresh green beans with chicken : A healthy juicy chicken recipe! A traditional Greek dish, very tasty and healthy! It combines perfectly the green beans with the chicken. Put some olive oil in frying pan and heat it on medium to high. Add the chicken pieces and cook for 3-4 minutes, on both sides. Add the garlic and continue cooking for another 1-2 minutes. Pour the tomatoes and the paste, reduce the heat to medium-low,add the cinnamon and the allspice. Stir. Add the water and the green beans. Stir gently and cook for 1hour. Add the parsley. Stir and serve. Kali oreksi! 1. The best side dish for this recipe is freshly baked bread and feta cheese. 2. If you use frozen green beans, do not add them at the same time with the tomatoes! They will take less time to cook, so add them about 10 mins after the tomato sauce has started simmering.